I am, believe it or not, RUNNING in and OUT tonight! I've been in quite a bit of pain the past week and it has become progressively worse over the course of the weekend, so I am phoning the clinic in the morning to speak with the PA. She had wanted me to wait six weeks to do my blood work for my thyroid levels, but there is something NOT right with me abdominally so I shall see if she can get me in this week, hopefully on Tuesday as she is not in on Mondays. Okay, enough of about that - just so you know where I'm at and why I still don't have NEW pics of Kaleb up yet!!! I will be adding a few to the slide show after I get this post and your FREEBIE uploaded!!! I am excited as Mark is stopping by after work to pick me up and take me to his house so that I can spend some time holding my "baby bundle"!!! And, of course, take MORE photos!!! Today was our grand-niece, Halia's first birthday party and I missed out due to my health concerns. Just not like me not to be at a SPECIAL family event snapping away! I'm hoping Jenn will e-mail some of the party pics to me so that I can scrap them and make a slide show!!! Halia is just the SWEETEST baby girl and is SO petite and walking!!! I received a birthday photo via e-mail as Jenn was sending out a reminder for the party and Halia has (ready for this?) red and white flowers in her hair that are a PERFECT match with the flowers in *Saturday in the Park*!!! Yep, you guessed it - ANOTHER scrapatit on the horizon made especially for this photo. AND ... I was just over at Misty Cato's blog earlier today and she has ONE dynamo tutorial going on with a VERY cool and EASY way to do some FABULOUS blending of a photo into a background paper. I hope you like this addition to *Saturday in the Park*!!! You will find two more background papers. I like the neutral one as it gives a fair rendition of SAND that you just might find during your visit to the park! The leaves ARE NOT part of the background paper. 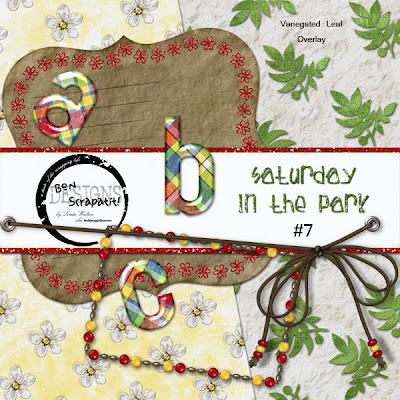 It is actually the variegated overlay I created to use on BG Paper #8 and for Scrapatit #1!!! My favorite in tonight's freebie is the Plaid Epoxy Alpha!!! I just LOVE plaid, don't you? A BIIIIIIIIIIIIIIIIIIIG shout out of THANKS to ALL of you for such LOVELY comments (y'all ROCK my world ya know!) and for sharing your INSPIRATIONS with me (LOL ... listening to the song as I type!!!) and I think it is WONDERFUL that so many of you have chosen your parents and husbands! I also ENJOYED the one posted about a DAUGHTER being one's inspiration. I can REALLY relate to that as well as I have GREAT admiration for both of my daughters who are grounded, intelligent, respectful, loving, FUN and just all-around FABULOUS to speak with!!! Stay-tuned for some WONDERFUL layout shares from some of you who have been SO kind to send them to me or e-mailed me the link to where you have them posted!!! THANK YOU! Okay, I'm outta here!!! Good night darlins' - HAPPY MONDAY!! !